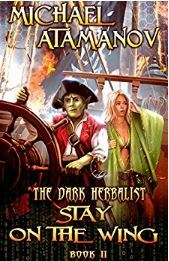 This is book 2 in the Dark Herbalist series with Amra, the goblin herbalist, and his plotline testers. This story picks up right where the first one ends with Tim (Amra’s player’s real name), his sister, his girlfriend and friends playing an online VR MMORPG. In part two, other players who watch Amra’s video stream become upset that Amra, a small, weak new player, somehow gets a unique flying mount in the game so the game company decides to put the mount up for grabs to any player who can hunt and kill Amra. The majority of the book is the story of Amra running from the other players, including a large portion of the book where Amra becomes a pirate captain with an orc army. Like the first book, Amra continues his long trek towards awesomeness as just about everything works out for him. The first book in this series was my first experience in LitRPG or GameLit a sub genere that tells a story through the perspective of a game player – usually a VR player in the near future. Books like Ready Player One or other books with VR as an integral plot device aren’t the same thing as LitRPG. The focus on LitRPG novels is the game playing and RPG leveling aspects. In fact, in this series, the plotline tester aspect of the books was all about the company showing people that playing a goblin herbalist was fun and worthy of their time. The story is constantly interrupted with skill updates, character leveling, experience, game notifications, and other aspects of RPG gaming that gamers know and appreciate. I’m not sure other readers will understand as well or appreciate things. The biggest thing that non-gamers need to know if that the vast majority of how this “game” goes is wrong. No one wins as much as Amra does. Nothing goes wrong for him. Nothing. Even when he makes a mistake the game somehow adapts what he did and makes it a win for him. Real games as grind, loss, playing, fun, loss, grind and loss. I bought books 2 and 3 at the same time. Otherwise, I’d likely not finish these fun but vapid stories.